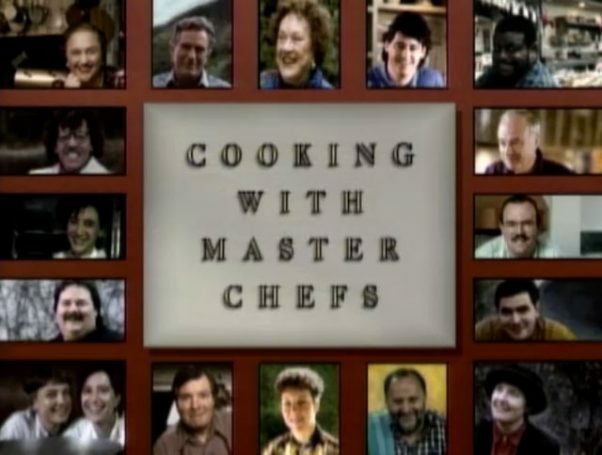 In COOKING WITH MASTER CHEFS, Julia Child visits sixteen nationally acclaimed master chefs in their own kitchens. Each chef demonstrates distinct techniques, regional recipes, and culinary tips which guide home cooks through their favorite recipes. Expertly preparing each dish and teaching with passion along the way, the master chefs offer the viewer a unique and inspirational learning experience. The base of so many favorite desserts, pie pastry is a simple recipe combining just a few basic ingredients. So why does it frighten so many home chefs and bakers? Sometimes the dough rolls out too wet and sticky, and other times dry and crumbling, with no structure at all. And that’s just part of it. As the pie bakes, more worrying ensues. Will it be too tough to cut or too delicate to handle? Then, what if it’s soggy from the juicy filling inside? Say good-bye to the pie pastry blues as you become the master of your own dough with the help of these tips. Cube cold butter. Cut your cubes into pieces and make sure that they are well coated with flour before you begin cutting them into the dough. It’s necessary to have the butter separated into pea-sized pieces throughout the dough for evenly distributed fat and flavor. Add a little shortening. For flakier results, substitute about half of your butter with refrigerated shortening chunks and work both into the dough in tandem. Combining the two will result in optimum buttery flavor and tender texture. Measure correctly. Nothing is more important in baking than using the appropriate amounts of each ingredient. For dry, scoop ingredients into correct measuring cups and level off with a straight edge to remove excess. Pour liquids into glass measuring cups until you can see that they’ve reached the desired calibration at eye level. Mix all-purpose flour with cake flour to make pastry flour. If you use all-purpose flour alone, your crust may turn out tough. Conversely, the low protein content of cake flour by itself will make it too delicate. Combine the two and it’ll be just right. Make sure your water is icy cold. The key to flaky dough is suspending fat deposits of butter and shortening, rather than fully incorporating them into the dough. The colder the fat remains, the easier it is to turn out the ultimate pie. Blend only until ingredients come together. Mix ingredients delicately with your fingertips or pulse in a food processor. As soon as the dough feels stable enough to hold together when pressed in the palm of your hand, STOP! Go past that point and your dough will begin to toughen. Strengthen with egg. If your ultimate goal is to create a durable dough–perhaps for handheld hors d’oeuvres–use egg as the liquid component of your dough. The added protein will work to bind and you’ll be left with an unshakable crust. Roll out on a cool surface. Dust a smooth, dry surface with flour and grab hold of your rolling pin. Start from the center of the dough, working out so that your dough ends up spread evenly throughout. Also, be certain to carefully lift your dough sheet off of the rolling surface every so often to ensure it’s not stuck. You can always add more flour if necessary. Chill and rest dough before and after rolling. Allowing your dough to sit will make it less likely to shrink in the rolling process or while it bakes. Just like you, your dough’s been through a lot–treat it gently and with care and you’ll have made a new friend.